Our Silent Mind Technique™ is a method for eliminating the 'voices' (auditory hallucinations) of schizophrenia, as well as the typical 'mind chatter' or obsessive thoughts that many people experience. Our goal is to eliminate this terrible disease by making our approach available to therapists worldwide. 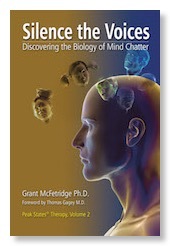 Our new book Silence the Voices: Discovering the Biology of Mind Chatter will be published November 2017. Although we have already developed two successful, well tested techniques (click here for treatment), we are continuing the research because we felt the treatment needed to be simpler and cover more (non-voice) symptoms in severe schizophrenics. We are currently working on a new approach that makes the schizophrenic lose the voices and make them feel very safe in the world as well. This improved treatment also eliminates several other far more uncommon diseases that can cause some voice-like symptoms. This process also eliminates the most common form of "psychotic auditory hallucinations" of schizophrenia. Surprisingly, these 'voices' are actually ordinary, everyday 'mind chatter', but are overwhelming because the client cannot suppress them like a typical person can. We’ve discovered that this problem of mind chatter is due to a common fungal infection that interacts with in utero trauma - this problem is an epigenetic, not a genetic disorder. Two types of treatment are available: a fast and simple procedure that eliminates individual voices; and a psychoneuroimmunology approach that makes a person immune to the fungus, eliminating all 'distracting thoughts' or 'voices' simultaneously. The effects are permanent in either approach. If you are a mentally healthy person who is affected by obsessive thoughts, a 'noisy mind', or you 'hear voices', an Institute certified therapist can work with you, remotely over Skype if you prefer. This website lists therapists around the world, describes the treatment, the 'pay for results' policy, and covers other questions you may have. If you are under medication, we recommend you work with one of our Institute clinic staff. This website lists the clinics you can contact, and describes the typical course of treatment. The client does not need to be able to follow verbal directions, but it is helpful. No physical intervention is needed, no chemicals or drugs. We use state-of-the-art trauma healing techniques for the process. Clients who have used our technique have written testimonials. We continue to work with volunteer clients to help improve our techniques. The experimental subject legal disclosure form can be downloaded here. A very good summary about schizophrenia can be found online in the Wikipedia. "Prenatal exposure to maternal stress and subsequent schizophrenia: The May 1940 invasion of the Netherlands" by Dr.s J. van Os and J. P. Selten, 1998 article on in the British Journal of Psychiatry 172:324-326. This was a key study linking prenatal trauma to schizophrenia. PubMed lists related papers on trauma and schizophrenia in its database. "Childhood trauma, psychosis and schizophrenia: a literature review with theoretical and clinical implications" by J. Read, J. Os, A. P. Morrison, and C. A. Ross, Acta Psychiatrica Scandinavica, Volume 112:5 November 2005, pp. 330-350. "Delayed Post Traumatic Stress Disorder Model for Schizophrenia and Depression: The Unification Theory of Mental Illness", Dr. Clancy McKenzie M.D. 1998, Trauma Response, Volume 4 Number 2. Dr. McKenzie, studying thousands of schizophrenics in the USA, found that trauma in the first years of life was at the root of cause of schizophrenia in the people studied. Another version is "A Unification Theory of Mental Illness", 1998, Frontier Perspectives, Volume 7, Number 2, Temple University, Philadelphia. Delayed Post Traumatic Stress Disorders from Infancy: The Two Trauma Mechanism, by C McKenzie and LS Wright, 1996, Amsterdam: Harwood Academic Publishers. Models of Madness: Psychological, Social and Biological Approaches to Schizophrenia, edited by Richard Bentall, Loren Mosher, John Read, 2004. Trauma, Metacognition and Predisposition to Hallucinations In Non-Patients" by AP Morrison, and T Petersen, Behavioural and Cognitive Psychotherapy, 2003, 31: 235-246. Of even more importance, the conventional model says that, by definition, if you hear voices ("auditory hallucinations"), you are mentally ill with schizophrenia. (A diagnosis of schizophrenia using the DSM 4 categories is not very repeatable from therapist to therapist, but roughly 70% of people with this diagnosis hear 'voices'.) Recent studies at NIMH in the USA show that 2/3 of the population that reports hearing voices has no other sign of mental illness whatsoever. Several other studies also agree with this. There is a 'continuum' that people are on - most 'schizophrenics' are totally sane, except that they 'hear voices' - the same voices that most people do. This is also in agreement with our own findings. An organization in England is working to change how schizophrenia is seen and treated. They are the 'Hearing Voices Network' at www.hearing-voices.org. For an overview of this movement, go to the wikipedia. "Auditory Hallucinations: a comparison between patients and nonpatients", by A. Honig, MA Romme, BJ Ensink, SD Escher, MH Pennings, and MW deVries, Journal of Nervous and Mental Diseases, October 1998, 186!10): 646-51. "Psychotic symptoms in non-clinical populations and the continuum of psychosis", H Verdoux, Jim van Os, Schizophrenia Research, March 2002, 54:1-2, pp 59-65. "Factorial Structure of the Hallucinatory Experience: Continuity of Experience in Psychotic and Normal Individuals", M Serper, CA Dill, N Chang, T Kot, J Elliot, Journal of Nervous and Mental Disease, April 2005, 193(4): 265-272. "The continuity of psychotic experiences in the general population", LC Johns, J van Os, 2001, Clinical Psychology Review, 21 (8), 1125-41. There is other data supporting a disease model for schizophrenia. Schizophrenia is rare or unknown in isolated tribes that had no previous contact with Europeans - but some years after contact it appears. For example, in The Institutional Care of the Insane of the United States and Canada (1916) pg. 381, it was noted that in 1827-9 there was no evidence of any mentally ill Cherokee before or during the period of their forced relocation (the trail of tears). As the psychiatrist Dr. E. Fuller Torrey writes in his Schizophrenia and Civilization (1980), this worldwide epidemiological data started being ignored in the psychiatric literature around 1950, probably because it didn't fit into the beliefs about mental illness at the time. We've recently know of a client who had paranoia and voices that were successfully treated with a brain biofeedback approach - the results have been stable for a year. We don't know much about this approach yet, nor do we know what percentage of people this works for - but it is certainly worth checking. The organization is Brain State Technologies, and they have licensed their technology worldwide. Dec 23, 2015: Added the epidemiological data paragraph. June 29, 2015: Added a video on the fungal cause for hearing voices. Shortened much of the text since we now have the therapist and clinic websites covering this material. May 4, 2011: Revised the page to indicate that the Silent Mind Technique is now used by our therapists and clinics, and is past the testing stage. Dec 16, 2009: Change in the status from initial testing to beta testing in our clinics; with certified therapists treating less ill clients. Feb 4, 2007: Description of our test of the schizophrenia ‘voice hearing’ elimination process.